Amanda Campos has faithfully served her community with distinction for more than 12 years. 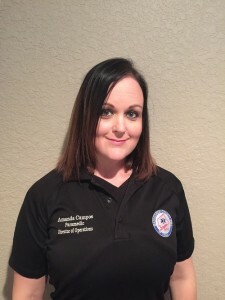 In February of 2010, she was named Director of Operations at Matagorda County EMS and took command of one of the finest EMS agencies in Texas. command vehicle on nights and weekends, often with her family in tow, and served on numerous community service projects. She is a true public servant, a highly respected teammate, and the very definition of a leader. These qualities came to life one busy evening in December of 2015. While on her way to the grocery store with her twin four-year-old daughters, she heard a call come in about an infant not breathing. Knowing that all ambulances had already been dispatched to calls, she responded without hesitation. While en route, Amanda radioed to dispatch and requested to have a crew member, who happened to be at the station without a partner, meet her at the patient’s address with an ambulance so that they would have transport capabilities. Upon arrival, Amanda found the infant to be in full arrest with a Bay City Police officer attempting to provide respiration. Finding the infant to be apneic with poor perfusion, she began CPR and intubated while waiting for the ambulance to arrive. Her resuscitation efforts were successful, and the infant was transported to the hospital without any delay. Chaplain Chad of the Bay City Police Department followed behind the ambulance with her daughters and stayed with them as she continued to provide care. The patient is alive today thanks to Amanda’s quick actions and tireless efforts. Amanda’s selfless commitment to the health and safety of her community is just one of many examples of the spirit of caring at Allegiance Mobile Health. On behalf of the executive leadership team, all 1,200 employees, and the countless lives she has touched during her career, we are proud to nominate Amanda Campos for the 2016 Star of Life award.